The election was held on 7 September, 2013. On 26 June, 2013 Kevin Rudd replaced Julia Gillard as leader of the Labor Party following a significant drop in caucus support for Gillard and polling indicating large losses for the Labor Party if Gillard contested the election. The Liberal/National coalition was again led by Tony Abbott. The campaigns of both parties focused on the need for change with the Labor party adopting the slogan of A New Way and the Liberal Party running with Choose Real Change. A Stronger Australia. A Better Future. While Labor highlighted their policies for improving employment and education, the Coalition promised a ‘no surprises, no excuses government’ focused on stabilising the economy and ‘stopping the boats’. The Liberal/National coalition won the election securing 90 seats in the House of Representatives to the Labor Party’s 55 seats. After a close contest, the division of Eden Monaro retained its status as a ‘bellwether seat’ with Liberal challenger Peter Hendy winning the seat from the Labor Party’s Mike Kelly. Anthony John Abbott was born 4 November, 1957. 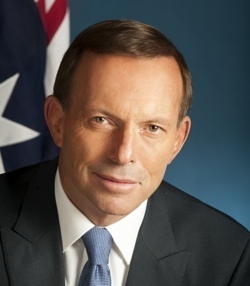 Abbott became the Prime Minister of Australia, following the victory of the Liberal/National coalition at the Federal Election on 7 September, 2013. He is the Leader of the Liberal Party of Australia. He has represented the electorate of Warringah, NSW since 1994. I will spend the next two weeks reassuring people that there is a better way while Mr Rudd will spend the next two weeks trying to scare you about what might happen if he doesn’t keep his job. Well, it’s not about him and it’s not about me. It’s about you and how a better government can help your family and make your job more secure. It pits the Liberal and National parties’ positive plans for the future against more of the same from a confused and chaotic Labor Party. We are a great country and a great people but we can’t afford another three years like the last six. We’ll build a stronger economy so everyone can get ahead. We’ll scrap the carbon tax so your family will be $550 a year better off. We’ll get the budget back under control by ending Labor’s waste. And we’ll build the roads of the 21st century because I hope to be an infrastructure prime minister who puts bulldozers on the ground and cranes into our skies. We’ll end Labor’s big waste—like the $11.5 billion in border protection cost blowouts. We’ll end Labor’s small waste—like the $180,000 that the Department of Human Services spent studying ergonomic chairs. And we’ll end Labor’s ridiculous waste—like selling the parliamentary billiards tables for $5,000. We understand, deep in our DNA, that you can’t have a strong society and strong communities without strong economies to sustain them and you can’t have a strong economy without profitable private businesses. We understand that government doesn’t create wealth, people do; and that no country has ever taxed its way to prosperity. We’ll abolish the carbon tax so power prices and gas prices will go down. We’ll abolish the mining tax so investment and employment will go up. We’ll cut the company tax rate because, as the former Treasury Chief has said, the main beneficiaries will be workers. We’ll cut red tape by $1 billion a year every year because the businesses of Australia should be competing, innovating, marketing, investing and employing, rather than simply lobbying government for more favourable rules or the best possible handout. We’ll move the workplace relations pendulum back to the sensible centre, restore a strong cop-on-the-beat in the construction industry, and hit dodgy union officials with the same penalties as corporate crooks. I want us to be a better country, not just a richer one, but you don’t build a better society by issuing a press release. It’s much easier, after all, to persuade people to do more for others when it doesn’t involve robbing Peter to pay Paul. And the motor industry will be saved from Mr Rudd’s $1.8 billion tax on company cars. The Australian Building and Construction Commission will be running again, and the true state of Labor’s books will be revealed. The NBN will have a new business plan to ensure that every household gains five times current broadband speeds—within three years and without digging up almost every street in Australia—for $60 billion less than Labor. By the end of a Coalition government’s first term, the budget will be on-track to a believable surplus. We won’t shirk hard decisions. We’ve already announced $17 billion in sensible savings. We’ll trim the commonwealth public sector payroll by 12,000 through natural attrition because we don’t need 20,000 more public servants now than in 2007. We won’t continue the school kids’ bonus because it’s a cash splash with borrowed money that our children will have to repay. We can’t continue the low income super offset because it’s funded by a mining tax that’s not raising any money. We’ll delay the superannuation guarantee levy increase because it’s another cost that small business can’t afford right now. And we won’t increase the humanitarian migrant intake until such time as it’s no longer being filled by people smugglers. There will be no new spending under a Coalition government that’s not fully-costed and fully-funded. By the end of a Coalition government’s first term, working with the states, teacher standards will be rising and teaching programmes will be improving. And there will be a fair dinkum paid parental leave scheme in place, because factory workers and shop assistants deserve to get their actual wage while they are on leave—just like public servants do. We must be a country that rewards people for having a go—but we must never leave anyone behind. That’s why I announce today that an incoming Coalition government will finally index eligibility thresholds for the Commonwealth Seniors Health Card so that more self-funded retirees will have access to cheaper medicines. As well, an incoming Coalition government will commit an additional $200 million to dementia research to help the 300,000 Australians who have it today and to help the 900,000 at risk of having it in 30 years’ time as our population gets older. This will be available to the 60,000 mostly young Australians who next year will start learning the trade skills that are in short supply—the electrical, plumbing, carpentry, cooking, welding and mechanical apprenticeships—that only half of them, on current figures, will finish. This is a hand-up—not a handout—for people who will meet our skills needs for the next 40 years. If our vision is realised, within ten years, Australia will have lower, simpler, fairer taxes. We’ll have a more functional federation where the states are sovereign in their own sphere. The infrastructure gap will be filled—with the Pacific Highway duplicated, the Midland Highway upgraded and the Bruce Highway flood-proofed. Starting next year, I will work to recognise indigenous people in the constitution—something that should have been done a century ago that would complete our constitution rather than change it. Because, if they’re good enough for people to live in, they should be good enough for a prime minister to stay in. My vision for Australia is not that big brother government knows best; it’s that our country will best flourish when all of our citizens, individually and collectively, have the best chance to be their best selves. Government’s job is rarely to tell people what to do; mostly, it’s to make it easier for people to make their own choices. Over the next three years, should we win the election, an incoming Coalition government will do exactly what we’ve said we’ll do. It’s performance, not promises, that will earn your respect; it’s actions, not words, that you are looking for. After all, the best possible preparation for being a strong and effective government is being a strong and effective opposition—especially when 16 members of the shadow cabinet were ministers in the last government that stopped the boats and brought the budget back into the black. You don’t expect miracles; just a government that is competent and trustworthy and a prime minister who doesn’t talk down to you. When I look at workers and managers, I don’t see people trying to rip each other off but people trying to get ahead together as a team. When I look at skilled migrants coming to Australia to work and pay taxes from day one, I don’t see people who are stealing Aussie jobs but people who are building our country; and who have come here to join us, not to change us. When I look at small business people, I don’t see people who need to be regulated and controlled for their own good but people who have mortgaged their houses to employ their staff and serve their customers. When I look at farmers and fishermen and foresters, I don’t see people despoiling the environment but people who are our best conservationists because that is the only way that their children and grandchildren can follow the same calling. When I look at pensioners and superannuants, I don’t see people who are a drain on the taxpayer but people who have built the country that I am lucky enough to live in. When I look at the benefits that all Australians rightly enjoy such as Medicare and good public schools and hospitals, I don’t see “middle class welfare” but the hallmarks of a society that gives families a fair go. I am fundamentally optimistic because I know that tomorrow can be better than today when it’s built on the values that last. But the worst deficit is not the budget deficit but the trust deficit. This election is all about trust. Mr Rudd knows that his government has failed—that’s why he never talks about his record. He knows that the carbon tax has been a disaster—that’s why he’s faked abolishing it. He knows that the Labor Party has become a national embarrassment—that’s why he’s faked reforming it. He knows that a serious country can’t lose control of its borders—that’s why he’s faked a PNG solution that’s taken scarcely 10 per cent of the 3,000 new boat people that have arrived in just five weeks. He knows that no one wants another three years like the last six; that’s why his campaign is not about what he has done but what he says that I might do. He says that a Coalition government would sack nurses and teachers even though we don’t employ any…and sell schools and hospitals…even though we don’t own any. So not only is Mr Rudd leading the most incompetent government in our history, he’s now running the most dishonest election campaign in our history. So my question is this: if the people who’ve worked with Mr Rudd don’t trust him, why should you? The Labor Party has form when it comes to telling you to put your trust in people who don’t deserve it. Now Labor is telling you to trust Kevin Rudd again—but the one thing you know is that you can’t trust what Labor tells you. To Labor voters wondering why your party has sold its soul to the Greens; to Green voters wondering why your party has embraced socialism over environmentalism; to independent voters wondering why your MP has sided with a bad government, to everyone who has been let down and embarrassed by the circus in Canberra, I say: give my team a chance. That’s the choice I urge you to make.